Why is the Kumbh Mela such a special celebration? Pitru Karma and Pitru lokha - What are our forefathers capable of? Narsingh Chaturdashi or Narasimha Jayanthi is a Hindu festival that celebrates the victory of good over the evil. This is the auspicious day when Lord Vishnu incarnated as Narasimha to withhold the Dharma (righteousness) and Bhakti (devotion) displayed by Prahlada Maharaja. People all over India, celebrate this day usually with fasting and worshiping lord Narasimha with various special rituals such as abhisheka and archana, which are performed at dusk. This is because Lord Narasimha is said to have destroyed the evil Hiranyakashipu during this part of the day. These sacred rituals are followed by sankeertana (recital of holy songs) and Hari naam parayana (chanting of lord Vishnu’s name). 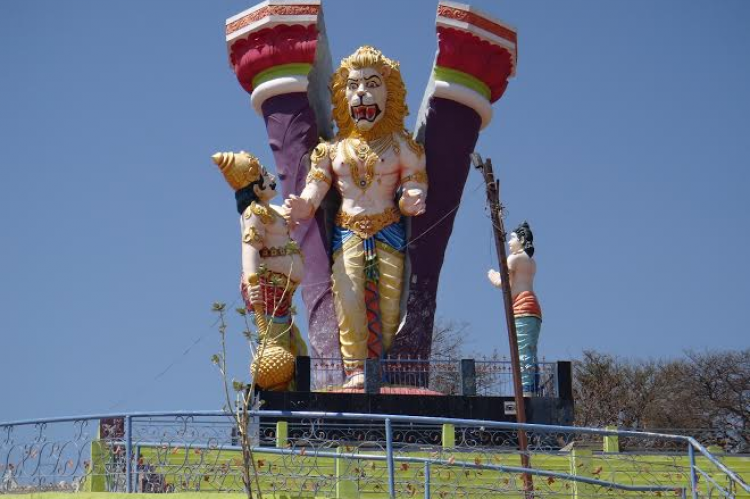 Tadavas is a village located in the Jaipur district of Rajasthan, which is popular for a Narasimha Mandir. This mandhir celebrates the festival of Narsingh Chaturdashi in a special manner. Narsingh Leela (Play elaborating the story of Narasimha) is organised in this village every year, in the hindu month of Vaishakha, on Narsingh Chaturdashi (in April-May). Thousands of devotees gather around this village to witness the famous Narsingh Leela (Play). Narsingh Avtar and Varah Avtar are the two main attractions of this Leela (Play). A Special food called the “Panaka” (Cool sweet drink made out of sugar tulsi leaves mint and Khas) is prepared and is offered to Lord Narasimha on this auspicious day. 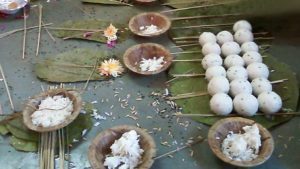 Wet Mooong and chana dhals along with seasonal fruits are made as offerings. 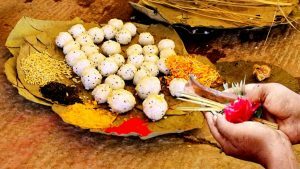 The above items are offered as Prasad and then distributed to all the devotees gathered on this holy occasion of Narasimha Jayanthi. According to Puranas, Lord Narsimha is one of the most powerful incarnations of Lord Vishnu. He is also one of the much-celebrated deities of Hinduism. He is believed to possess the face and claws of a lion, while having the body of a human. He thus is visualized as half-man/half-lion. The main objective of the Narasimha avathara, was to end the tyranny of the evil Hiranyakashipu, thereby restoring the path of Dharma (righteousness). 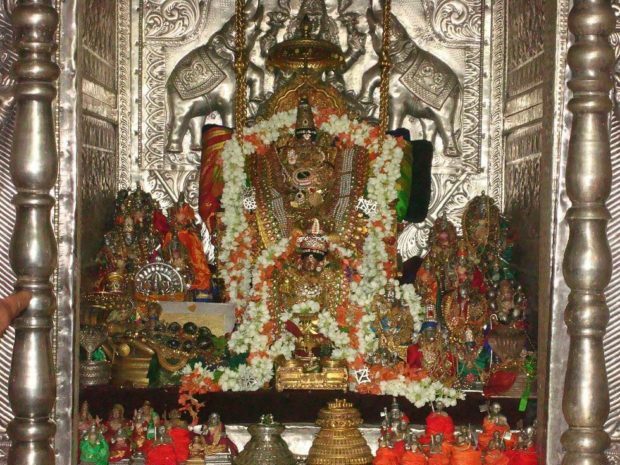 Prahlada, the young son of Hiranyakashipu was an ardent devotee of Lord Vishnu. He is said to have played a major part in the removal of Adharma (evil). Lord Narasimha is regarded as a ‘Great Protector’ who comes to the rescue of his devotees at times of need. What is the significance of Basoda? Pitru Karma and Pitru lokha – What are our forefathers capable of? 2014 © Ishta Devata The world's largest Temple website. Elevate and keep your spiritual knowledge updated with our weekly newsletters. Thanks, your address has been added.